El Tablao de Carmen is one of Barcelona’s best flamenco shows, honoring one of the world’s greatest flamenco dancers, Carmen Amaya. Known for her skill, passion, technique, and fiery personality, Carmen—a native of Barcelona—performed at this very site for King Alfonso XIII of Spain during the opening of the 1929 Universal Exposition. 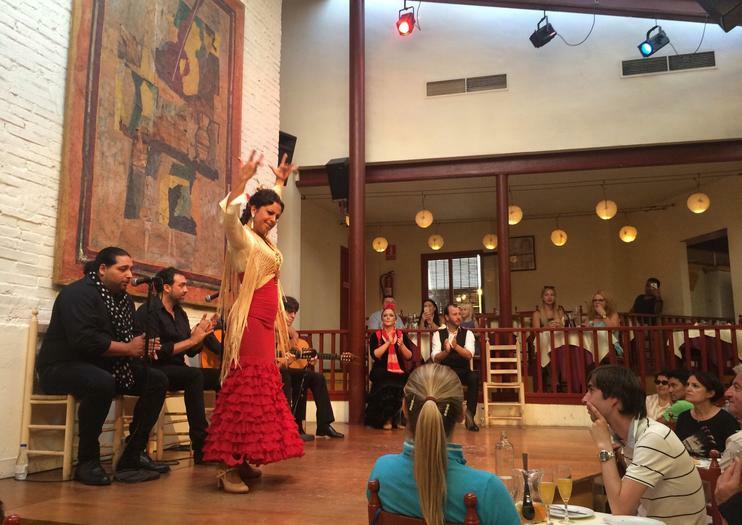 This intimate venue, fashioned after an Andalucian corral, hosts nightly flamenco performances with a lineup of up to eight artists, including four bailaor (flamenco dancers), two guitarists, and two cantaor (flamenco singers). Travelers have a few ticket options to choose from. The most basic includes a show and drink, while other packages include dinner and a show with various menus of traditional Spanish cuisine. The venue hosts two shows nightly, and your ticket includes free entrance to the Poble Espanyol re-created Spanish village. El Tablao de Carmen offers a romantic night out for visiting couples. It’s a good idea to book ahead, especially during summer, to avoid disappointment. Vegan, vegetarian, gluten-free, and dairy-free menus are available. El Tablao de Carmen is located in the Andalucian section of the Poble Espanyol de Montjuïc. To get there, take the Barcelona Metro to Plaça Espanya (lines 1 and 3) and walk up the hill, or take a bus to Poble Espanyol. El Tablao de Carmen stages two performances nightly Tuesday to Sunday. Performances tend to sell out during the busy season, so be sure to book your tickets ahead of time. Traditional flamenco was born in Andalucia in Southern Spain during the 18th century and didn’t make its way north to Barcelona until the second half of the 19th century. As more and more Andalucian-born Spaniards moved to Barcelona for work, they brought with them their flamenco traditions. Bliv fejret i den andalusiske flamencos passion ved Barcelonas Tablao de Carmen, en af byens mest kendte "tablaos" eller flamenco barer. Lav din egen vej til tablao i den spanske landsby og nyd et elektrificerende flamenco-show med flamboyant dans, sang, håndklap og gysende guitarmusik. Vælg mellem to showtider og vælg en drink, tapas eller 3-retters middag før forestillingen. Din oplevelse omfatter adgang til den spanske landsby, en rekreation af en traditionel spansk by fyldt med håndværk butikker, caféer og museer.